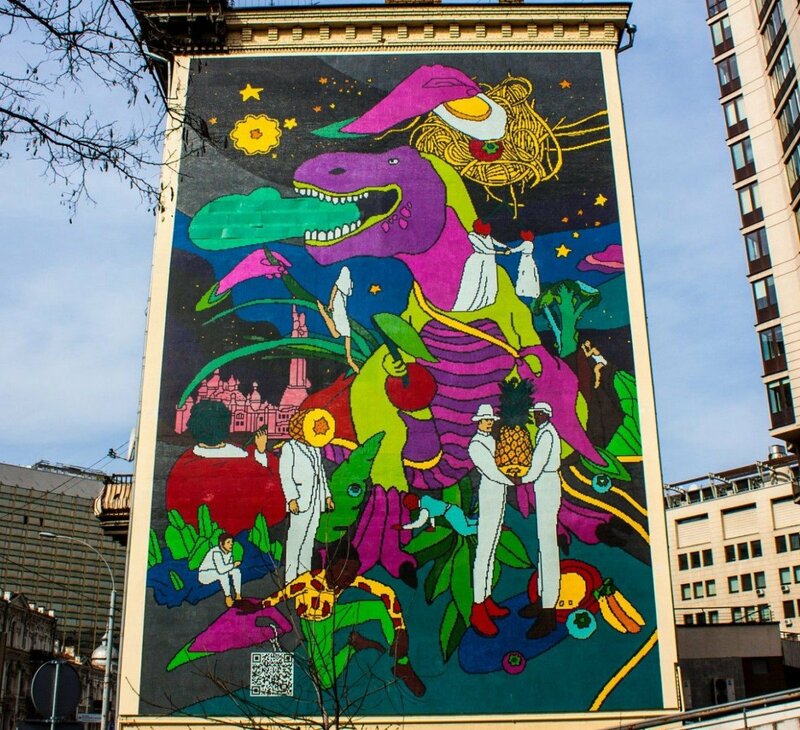 – Mural on the Velyka Vasylkivska Stree, 39 – created in 2017 by the street art-artist from Costa Rica Mata Ruda within the framework of the project “Art United Us”. Inspiration for creating a mural entitled “Flower inside the silhouette of Lesya Ukrainka” was the poem of the poetess “Hoping without hope”. The picture presents blossoming flower inside the silhouette of Lesya, which symbolizes the poem. – Mural on the Saksahanskoho Street, 61 – created in 2016 by South African artist Ricky Lee Gordon within the framework of the project “Art United Us”. The mural depicts a black horse hovering over a black square of sea waves. At the bottom of the picture there is an inscription: “Each river flows into the sea”. The prototype of the horse was the well-known monument to Khmelnytsky on the Sofia’s Sq. Water symbolizes the Dnipro as a source of life in Ukraine, running through the territory and flowing into the Black Sea. 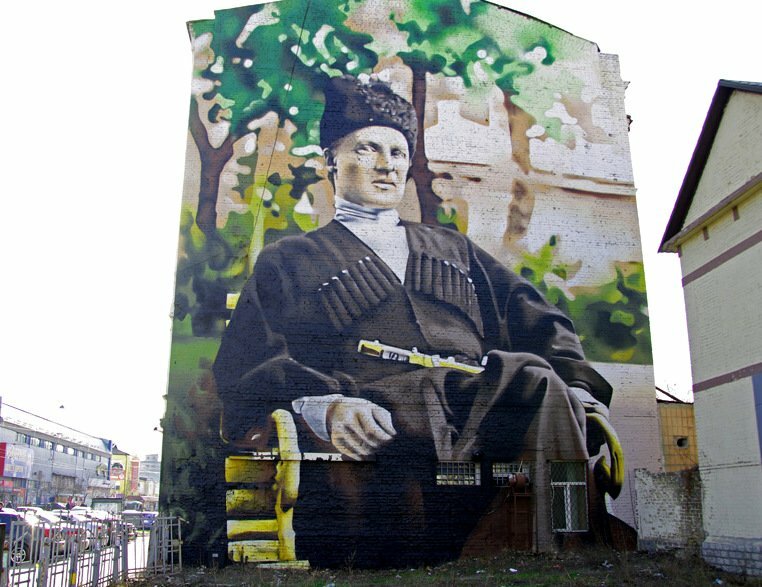 – Mural on the Saksahanskoho Street, 118 – created in 2017 by Leroy Lyashenko (illustrator) and Kostiantyn Skrytutsky (sculptor). Mural-mosaic “Talking dinosaur” is distinguished by bright colours and lots of details. The mosaic for the picture was made in Italy. 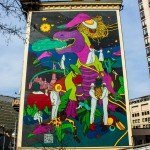 The picture depicts s a huge dinosaur with an open mouth, from which you can see a message board with text messages. You can also see spaghetti with scrambled eggs in the starry sky, a man with a pineapple instead of a head, a dark-skinned boy, etc. Near the boy there is a QR code where the inscription “Gift to the people of Kyiv from Silpo” is encrypted (the organizer of the project is the Silpo network). – Mural on the Starovokzalna Street, 12 – created in 2015 by a team of art-artists “Kailas-V”. 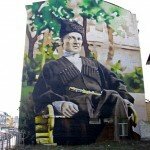 The mural “Skoropadsky” depicts the politician and hetman of Ukraine Pavlo Skoropadsky (29.04-14.12.1918). This work was created within the framework of the project dedicated to outstanding Ukrainian personalities who played an important role in the formation of the state. – Mural on the Antonovycha Street, 48-а – created in 2015 by the self-taught artist Sasha Korban. 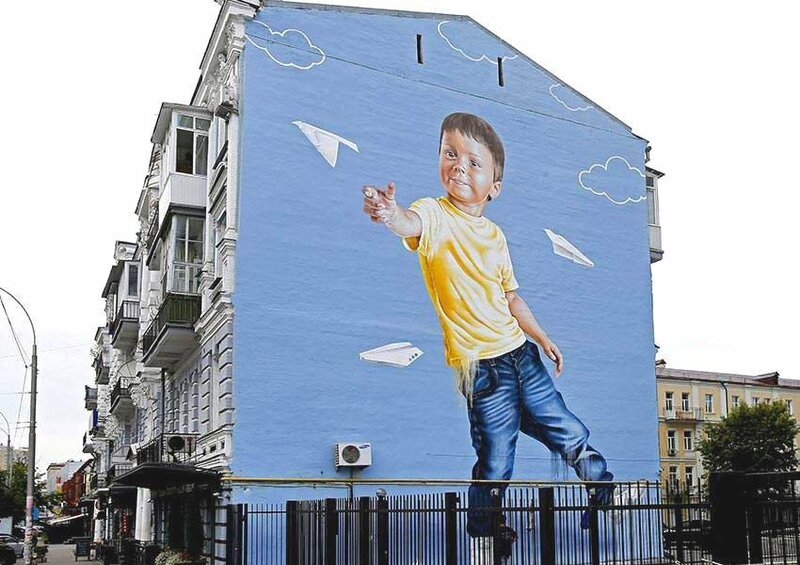 Graffiti “Paper planes” depicts a boy launching paper planes into the sky. 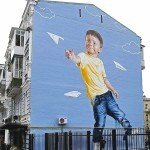 This is the first street art of the social project of the charitable foundation “Sky Art Foundation” about a real childhood – without gadgets and computers. The goal of the project is to interest children to spend time playing hide and seek or “hopscotch”, launching paper planes and reading good books.